If you would like to visit a museum just for fun, and to relax, Madame Tussauds will for sure please you. Here you can find wax figures of all kinds of celebrities like Madonna, Tiesto, Justin Timberlake, Robbie Wiliams and many more. 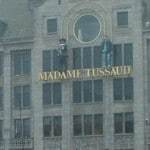 Madame Tussauds is normally open from 10.00 till 17.30, and the full-price entrance fee for adults is 21 Euro. The museum is easy to find, as it is located at the Dam Square, in the centre of Amsterdam. Skip the line? Buy your Madame Tussauds tickets online!